BLANCO has long been known for its deep-drawn parts far beyond the borders of Germany. 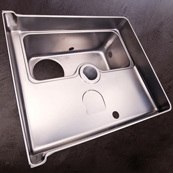 Especially when it comes to sink manufacturing, BLANCO has played a leading role for many years now. We also utilise this expertise for our industrial customers. Our deep-drawn parts are used in a broad range of different industries; we are suppliers in the food service industry, in the plumbing sector, the automotive industry and in the aircraft industry, where particularly demanding requirements are placed on our products. For our deep-drawn parts we use exclusively highly corrosion-resistant chrome-nickel steel from renowned manufacturers, because quality begins with the procurement of materials. This guarantees a long-term high surface quality and functionality. Give heat the cold shoulder. 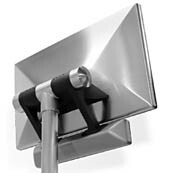 The rear housing for industrial PCs made of a combination of aluminium and stainless steel (multi-layer) distributes the heat generated during operation without any additional ventilation. Manufacturing: deep drawing, laser cutting. 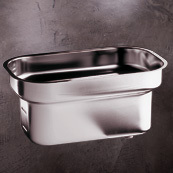 The base for industrial dishwashers goes through several drawing stages. Intermediate annealing restores the ductility of the material. 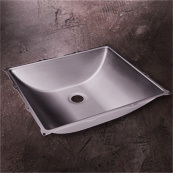 Through this, BLANCO Professional achieves a particularly high degree of forming. A sophisticated, deep-drawn design with narrow radii for building into the vanity area of the aircraft. Polished surface with anti-fingerprint coating. 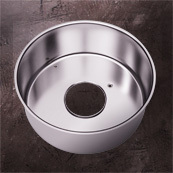 Deep-drawn part manufactured in several forming steps, with welded-in bottom drain connecting piece.